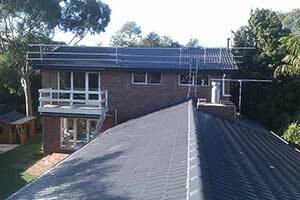 There is more to a Melbourne roofing job than simply replacing broken or missing tiles. Stormproof roofing also expertly and professionally performs the job with the highest quality bedding. Tile bedding is an important part of the roof restoration process. All roofs are exposed to the elements, which is the main cause of cracking and deterioration, leaving loose capping and holes in the roof. Damaged bedding can affect the overall stability of the roof because bedding is an important part of roof tiling. We are experts in straightening hips and ridges through removing the old mortar and starting again. To complete the process, our professionals then bed the capping in mortar to get straight and level ridges ready for pointing. Re-bedding can eliminate leakage which can start anytime, especially in Melbourne where the elements can be quite harsh. Stormproof Roofing gets all your roofing needs covered with zero inconvenience and small cost to you. Our service can surely enhance the value and the aesthetic appeal of your home. Stormproof Roofing has over 30 years of experience in roof re-bedding. We can assure you that our roof re-bedding service is carried out professionally, highlighting our quality workmanship. 03 9585 3744. You may also email us at [email protected].